Have you noticed taking a screenshot is harder in iOS 11 or iOS 10 and with iPhone 7 and iPhone 8? Maybe you tried to take a screen shot in iOS 11 or iOS 10 only to discover that you either locked the device, sent it to the Home Screen, or summoned Siri instead? This is a fairly common occurrence when taking a screenshot with an iOS 10 device, whether it’s an iPhone, iPad, or iPod touch, and has led some users to think that the mechanism for how to take a screenshot with iOS 10 was changed. Well, screenshots have not changed, but the sensitivity seems to be slightly different which requires a minor adjustment for some users to successfully capture screenshots in new iOS versions. 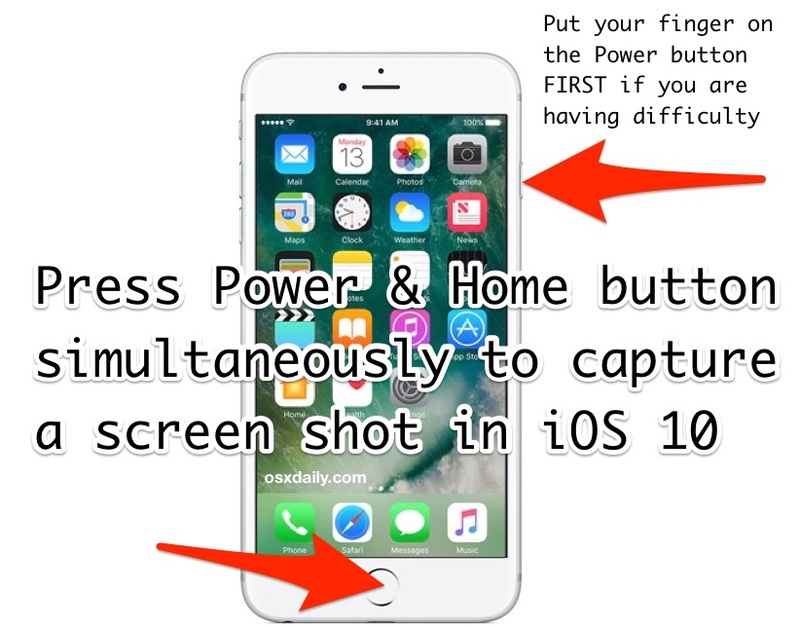 To be completely clear, taking a screenshot in iOS 10 and iOS 11 is the same as it was before: just press the Home button and Power button concurrently, the screen will flash, and the screenshot is captured and stored in the Photos app. So why does it appear different for some users in iOS 10? This is where the minor behavior adjustment matters. This refers to taking screenshots in any iOS version past the 10 release, including iOS 11 and later. You can tell the screenshot has been successful as indicated by the screen flashing briefly. The key difference with new iOS releases is simply pressing the Power / Lock button first as part of the concurrent Power & Home button screen shot maneuver. You still need to press Power and Home buttons simultaneously, press both buttons down at the same time, but place your finger on the Power button first in that process. The difference is barely a fraction of a second but it appears to matter, as the screenshot mechanism is a bit more finicky in iOS 10 with any iPhone, iPad, or iPod touch. This is particularly true on the iPhone 7 and iPhone 8 Plus without physical clicking Home buttons, and with iPhone 7, iPhone 8, and iPhone 8 Plus it even works better to press the Power button first and hold it slightly longer than usual as you press down on the Home button. You will see the screen flash demonstrating the screenshot was captured. If you go the other route and press the Home button a fraction of a second before the Power button, you’ll almost always get sent to the Home Screen, or wind up with Siri instead. The reason this issue only appears to impact some users and not everyone is likely due to slight variations in how people were taking screenshots in the first place. For example, if you were in the habit of doing a quick-press of both the Home and Power button, or to press the Home button first, you’re more likely to experience the unexpected result of going to the Home screen, finding Siri, or locking the display, rather than taking a screenshot. Try the Power button first and slightly longer press approach discussed here instead, it’s a very minor change to behavior but it makes all the difference. I thought it was just me, ha. 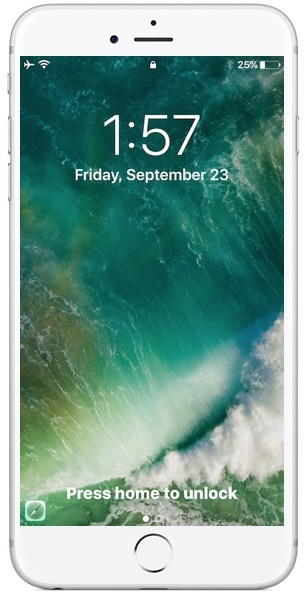 On the iPhone 7 I keep unlocking the iPhone rather than taking a screenshot of the Lock Screen, found that to be really annoying. The Power first trick works to screen shot every time though. Thanks. Add it to the list of things in iOS 10 that either don’t work (Messages is a mess), work in a completely different way than they have for a decade (slide to unlock), or were changed for no apparent purpose other than change itself (Timer now has white text on black instead of black text on white). This is a partial list. Very disappointed with 10, there’s nothing I like about it. Funny, I never have these problems with a droid. You can’t think of a single minor glitch like this? Not to be an Apple fanatic, I know that iOS/macOS have their problems too, but nothing’s 100% perfect. Sure — menus for one are an issue with my S7 Edge, but simple stuff like a screenshot? And I agree with Michael, Messages are REALLY a mess! Well said. I discovered this by chance on Saturday. I was one who thought it was broken. But it really is that fraction of a second! So far I keep getting pictures of the screen telling me ‘slide to power off’. A press is not a hold. Press both buttons for a screenshot, don’t hold them. “A press is not a hold” should be written in big letters somewhere. Two presses in the right order not a hold and press … that works, that’s the difference with IOS 10 – I was using the right order previously but holding the power as I pressed the home… two presses needed now. Now you’ll have a screenshot button on the screen of the iPhone or iPad. Thank you so much…my screenshot would work but kept glitching…had the force shutdown and restart and it would work for around 3 screenshots before…AGAIN…it would quit…black screen…. Click on more. Now you click on Screen Shot. Thanks!!! This is a great help. I tried turning off Siri but that just ended up with a notice appearing as I tried to take the screenshot saying that I should re enable Siri and if not, the iPad turned off. You’re over complicating this issue. It’s not about timing really. Simply, pre iOS 10 the action was hold home button and while holding it briefly press the power button to take the screenshot. Now with iOS 10 the buttons are effective reversed (this is probably to do with the fact that you now use the home button to unlock) so you now simply hold the power button and while holding it briefly press the home button to take the screenshot. It actually more forgiving now in terms of timing, because you can only hold home for < 1 second before Siri pops up, whereas you can hold power for 3 seconds before "slide to power off" appears. This gives a window three times as long in which to take your screenshot. With the new update trying to take a screen shot now is ridiculous! This function needs to be fixed immediately! I have tried several different things to try and take one and nothing happens! I’ve tried to the things that have been suggested and just no luck! Thank you very much for putting this up. Was getting really pissed off in a really short space of time! I can’t seem to add new cities to my world clock! Still unable to take screen shots. Any way to load old iOS back?! I thought it was just me struggling to take screenshots after iOS 10, thank you! Screenshot with iOS 10. Pse don’t get upset, It takes getting used to it. I had problems earlier but after some trials and errors, I can now do it without hassle. Good luck. Thanks La Luna. Button added. It’s very easy now. I have and SE and have the same problem. Have tried everything listed above, to no avail. Very frustrating. I use the screenshot function a lot editing videos on my iPhone. I’ve restarted it, tried all the different order or pushing buttons, but nothing. What a mess. I keep locking the screen and causing the image to scrunch down. Terrible waste of time. If not covered already…I found this after new 10 update on my iPhone 6. Opposite is true here; only if I press both they have to be EXACTLY at the same time or it bounces me out. Press Power button and Home button simultaneously, it screen shots in iOS 10… I put my finger on Power button first and it works every time. You don’t hold them down, you press them. Why not fix what you broke? excuse a few grammatical mistakes above…lol.. Thanks so much Paul for writing this up. I knew there’d be a simple answer but I could not work it out. A quick look and here I landed. A perfect explanation, thank you. Thank you Apple. Why do you change things that once worked fine, to something that requires some timing and dexterity? For the record, iOS 10 will rank right up there with Windows Vista as the most useless upgrade ever. Quit changing things for the sake of changing without improving anything. What happened, did you get a good deal on out of work Yahoo programmers? B. Abe I had no difficulty following the instructions and I am from the 60’s generation and a little bit before. You can make things difficult if you want to! I am surprised that an intuitive design has reduced to this with all the un-user friendly features! I’m having an issue screen shorting in landscape on my iPhone 6s. Didn’t ever have a problem before the update to iOS 10. Tried every trick suggested but it is as if the function was completely taken away. iOS 10 so far horrendous! After a thousand screen shot attempts I give up! Hating most of the changes so far! Thanks! I got the screenshot issue on my 6s after updating to ios 10. I was desperate, tried everything. And now this simple solution. Thanks that you told me! Thanks for all the above advice. Very pleased to find I am not alone or going mad. None of the above mentioned iPhone5 so after loads of attempts I concluded that screenshots really were broken for 5. I am an older, but determined, user and have eventually just had my first success. However this is not good enough odds for normal life so thanks to LaLuna I have added an accessibility button. I didn’t find the method mentioned in the article to work (for me, anyway) however scroll up to Phil Coate’s comment if you’re still having trouble. It’s just a click now instead of a hold. Works every time :-) Thanks Phil! 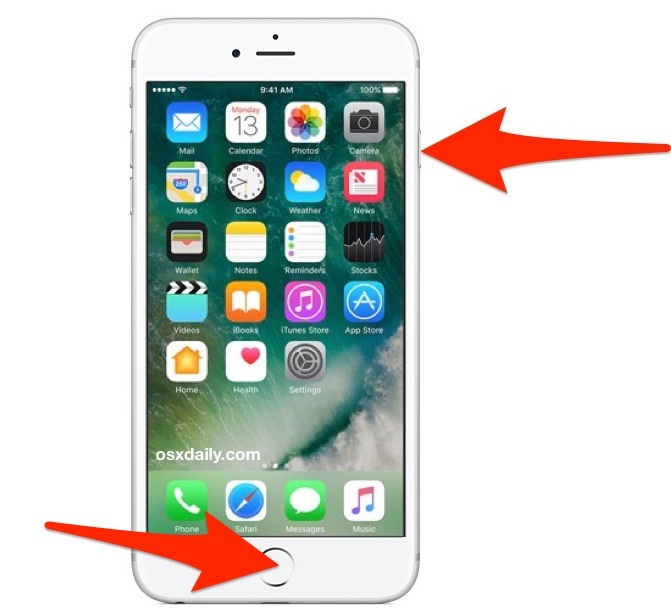 I think this problem is really significant on the iPhone 7. The new IOS coupled with the new home button methods mean I have to try for over a minute to get the screenshot to function. Trust me, it is a lot harder to do on the 7 than it was on the iPhone 6 I had previously on IOS10. The two upgrades (iPhone & and IOS10) combine to make something formerly easy into something you have to finesse. Who benefits from this? Fix it. The function of taking screenshots I already know. But I am wondering how to block the screenshot function in an App? Do you have any hint? Thanks, the power button followed quickly by the home button trick worked for my iPhone 6s. After doing this once, I could press both power & home button at the same time to take the sceeenshot as usual (before the ios10.2.1 update). Thanks, the power button followed quickly by the home button trick worked for my iPhone 6s. Thank you thank you thank you. It’s beeb driving me crazy!!! !